This documentary by filmmaker Steve Kroschel explores the effectiveness of the Gerson Therapy in treating cancer and other degenerative diseases. This natural cancer cure is currently being suppressed by the modern medical community, and many people have no way of knowing about its effectiveness. To study it, he spent 52 days traveling the world uncovering evidence of its effectiveness. Dying to Have Known is the result. To gather his evidence, Kroschel traveled across both oceans and to the farthest reaches of the United States. This gave him a global perspective on whether or not this treatment actually worked. 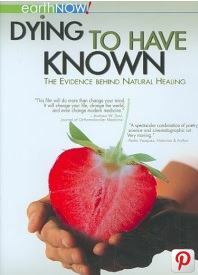 He interviewed doctors and patients, scientists and nutritionists, and just about anyone else with an authoritative voice and experience using the therapy. In the end, he found it to be an effective way to cure cancer and treat other degenerative diseases. For example, in this film you will hear from a patient who was diagnosed with terminal lymphoma over 50 years ago, yet is still alive today. Another interviewee is a Japanese medical student who used the therapy to cure his own liver cancer. Even with success stories such as these, most critics dismiss the method as quackery. Now, 75 years after it was proven to cure degenerative diseases and with numerous testimonies to back its effectiveness, it is still being suppressed, and few people are given the knowledge they need to actually save their lives.